Real Madrid were knocked out of the Champions League by one of their own as former youth trainee Alvaro Morata's second-half goal sent Juventus through to the final against Barcelona. As an inconsistent season for the Bernabeu club draws to a close, almost certainly without trophies, what does their European exit mean for the Spanish giants and their star performers? Gareth Bale headed into the game as the centre of attention after a turbulent week, having been heavily criticised for his performance in the first leg. Bale's agent Jonathan Barnett controversially responded to the negativity by complaining that his client would play better if his team-mates passed to him more often, but Real boss Carlo Ancelotti dismissed that suggestion and told Barnett to keep his nose out of Real's business. When the talking stopped and the action started, Wales forward Bale had a chance to prove the doubters wrong after just 34 seconds when he was picked out by Marcelo's cross, but could only head it powerfully over the bar. In a bright first half, the former Tottenham man also forced a fine save from Gianluigi Buffon with a powerful long-range strike, and created a chance for Cristiano Ronaldo with an excellent long ball over the top of Juventus's defence. In the second period, however, Bale's promising night fell apart. To the clear frustration of the home fans, he squandered two great chances to restore his team's lead - stabbing a close-range shot wide and heading over the bar - and was unable to rally his team for a late comeback. This was not a particularly bad performance but, considering the chances he missed, it could easily have been a heroic one. And his failure to take the opportunity to turn around his underwhelming season leaves him more vulnerable than ever. So how bad was the Welshman? 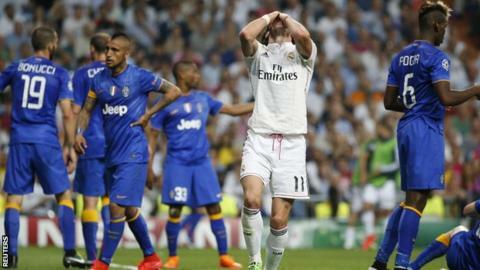 In truth, Real Madrid had been drifting towards this Champions League exit - and the collapse of their La Liga challenge - for a few months, rarely producing convincing performances since the turn of the year. Although there have been extenuating circumstances, notably a series of injuries to key players, manager Carlo Ancelotti will probably pay the ultimate price for his inability to arrest his team's long slide from autumnal excellence into springtime vulnerability. That is perhaps harsh on Ancelotti, who has remained a figure of calm authority throughout Real's disappointing second half of the season and cajoled a good first-half display out of them on Wednesday night. But 'nearly' is not good enough for Real - just ask Spain boss Vicente del Bosque, who was sacked by current president Florentino Perez in 2003 - despite winning the La Liga title two days earlier. Ancelotti has been a good manager for Los Blancos, reuniting the club after predecessor Jose Mourinho's divisive reign, but he is starting to bear the look of a man who needs a break from the relentless hyperbole that comes with the job - a club where one season must feel like 10. With former Borussia Dortmund coach Jurgen Klopp on the managerial market and Perez keen to get club legend Zinedine Zidane on the managerial ladder, there are viable options if Ancelotti leaves. From both his point of view and the club's, the time is probably right to part ways. Is time up at the Bernabeu for club captain Iker Casillas? Another man who may not - or should not - be at the Bernabeu next season is Iker Casillas, the iconic goalkeeper and club captain who is universally known in Spain as 'San (Saint) Iker'. In the last couple of years, the 33-year-old's halo has slipped. And more damage was done on Wednesday night, when he could have done more to keep out Morata's goal which sent Juventus to the final - although it was more a failure to make an excellent save rather than an out-and-out error. His place in the Real Madrid team first came under threat as long ago as December 2012, when he was controversially dropped by previous boss Mourinho, and ever since then it has been instalment after instalment of the Casillas soap opera. The last chapter of Casillas's career is looking like the classic story of a player who stubbornly does not know when to call it quits, despite an ever-growing number of strong hints his time is up. With Costa Rica international Keylor Navas waiting patiently for an extended chance and reports linking Real with a move for Manchester United's David De Gea, Casillas needs to do himself a favour and leave of his own accord before he is formally removed. Aside from his penalty, a notable aspect of Real's display against Juventus on Wednesday was Cristiano Ronaldo's failure to exert a significant impact upon the action. You might expect the back-to-back Ballon d'Or winner to be at the heart of his team's late push for a second goal, peppering Buffon's goal with a barrage of ferocious long-range shots - in actual fact he did very little, and not for the first time recently. He has been a peripheral performer on a number of occasions since the turn of the year, and even when he has contributed it has been in a different manner to the Ronaldo of old. At the age of 30, the days of lung-busting surging runs and unstoppable 25-yard pile-drivers appear to be behind him, with Ronaldo now carrying out the majority of his work in and around the penalty area and scoring his goals from inside the box. This is not to suggest he is no longer a world-class performer or that Real Madrid should dispense with his services. But perhaps he should now be seen chiefly as a penalty box predator who finishes other people's approach work, rather than the kind of player who can single-handedly take over a game and run the opposition ragged. That could also mean that Real will no longer base their playing approach around him, instead making the creative talents of James Rodriguez, Isco or even Bale the focal point of their attack. What do the Spanish press think? It may not last, but the Spanish media's initial reaction to Real's exit was measured and sympathetic. Madrid's main sports newspapers leapt upon the irony of a Madrid boy - former Real youth team product Morata - dumping his old team out of the competition, with Marca observing that a "Madridista" has prevented the "final of all finals" between Real and Barcelona. Similarly, AS lamented that "Morata leaves Madrid without a final", with columnist Alfredo Relano noting that the matchwinner "had to be" the ex-Real player. Their initial treatment of Bale is also sympathetic, with Marca saying "nobody can accuse him of not participating this time" and adding that only "Gigi Buffon and bad fortune" prevented him from getting on the scoresheet. AS, meanwhile, concluded "it was not his night" after highlighting his excellent first-half strike which drew the best save of the night from Buffon. Barcelona-based Mundo Deportivo, predictably, was less generous, pointing out that Real's reputation for mounting famous comebacks at the Bernabeu appears to be "a thing of the past". And the front page of another Barcelona-published paper, Sport, has the headline "What a shame! There won't be a Clasico in Berlin", complete with a smiley, winking face graphic.